This letter is written from Fitzhugh to Washington. You will notice that Fitzhugh’s style is one of using very flowery language and being very circumspect as to what he is trying to say. You might sum up his writing style as “why say something in one sentence when 5 or 6 sentences can be used to say the same thing”. This style was very common in this era. Fitzhugh has fallen on hard times and must make some tough decisions. He is obviously embarrassed writing this letter to his old friend and commander: George Washington. Fitzhugh entered the Army at the age of 19 and gave up his intended profession (we are not quite sure what that profession was). Fitzhugh married Elizabeth Chew (1766–1854) in 1781 soon after the Battle of Yorktown and now has several children. Her father, Samuel Chew, died in 1786 and therefore cannot provide support for his son-in-law. Fitzhugh’s father meanwhile had his estate extensively damaged near Baltimore during the Revolutionary War and had 50 Servants (slaves) taken by the British. As a result, Fitzhugh’s father can also not give support to his son. Peregrine Fitzhugh has therefore come up with a scheme to raise money and pay off debts. 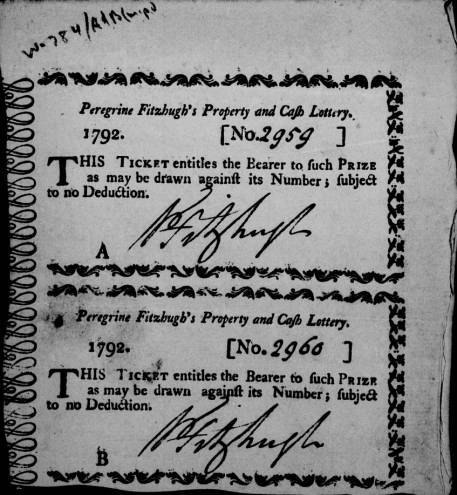 Fitzhugh’s “Scheme” entailed the sale of 3,827 tickets for $10 apiece and the distribution, following the lottery, of 177 pieces of land (168 three-acre parcels and nine larger tracts) and 173 cash awards (166 of $12 and seven of greater amounts). This letter is asking George Washington if he would like to buy into the lottery. There is no historical evidence that George Washington took him up on the offer. Amazingly enough, 2 of these lottery tickets still remain.